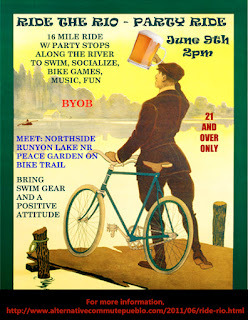 June 9th at 2pm, there will be a 16-mile party ride along the Arkansas River Trail. There will be multiple trailers pulling coolers, ice and music...you supply the beer, food, and fun. We'll haul your stuff out to the reservoir and back, making numerous stops to swim, relax, make new friends, play bike games, listen to music, socialize, and have a cold beer. Come for a great ride, relax, and start your summer off right. Everyone with a positive attitude is welcome! No worry warts or bad drunks. The start of the ride is on the north-side of Runyon Lake, near the Peace Rock Garden along the bike trail. For more information contact Javier at ridetherio@yahoo.com Here is an interactive map to verify the starting location.